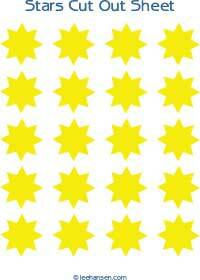 A full sheet of 8 pointed golden stars for your favorite paper craft or classroom activity. Use this printable sheet of stars to make a page of printable stickers for chore charts, to decorate a construction paper sky picture, or to make a lovely party banner or swag for the Christmas tree. Cut from card stock, add glitter and punch a hole to make window or tree ornaments. String together to create a garland of stars. These stars have 8 points, similar to those found on antique quilts and traditional designs from the Old West. You could use them to make sheriff or deputy badges for a cowboy theme party or stickers for party favors. Stars Cut Out Sheet prints on 8.5" x 11" paper in Adobe PDF format. Print and cut out using craft knife or scissors, a craft cutter or a circle punch. Silhouhette Studio software and the Cameo cutter make it easy for you to print and cut stickers, card stock and other materials from printables like the stars on this page and other die cut shapes. you can print, trace and cut this printable star sheet, or simply download this free STUDIO file shape sheet to cut out 8 point stars from card stock of any variety to make oodles of starry shapes at once. The die cut file is sized for 8.5 x 11 sheets, but can be modified to fit your card stock or other materials as desired. You can, of course, change the size and layout in Silhouette Studio. As with all our freebies, this die cut shape file is for personal use only. If you wish to share this shape sheet, please link to this page.